In February 2009, Patrick Michaels appeared before the Subcommittee on Energy and Environment to testify on “The Climate Crisis: National Security, Public Health, and Economic Threats.” He submitted a CV to the subcommittee which came under scrutiny for its omissions regarding Michaels’ financial and professional history with the fossil fuel industry. It also omits experience that was listed in a copy of his 1990 CV. Congressman Peter Welch issued a series of “Questions for the Record for Patrick J. Michaels” regarding the omissions in his CV. 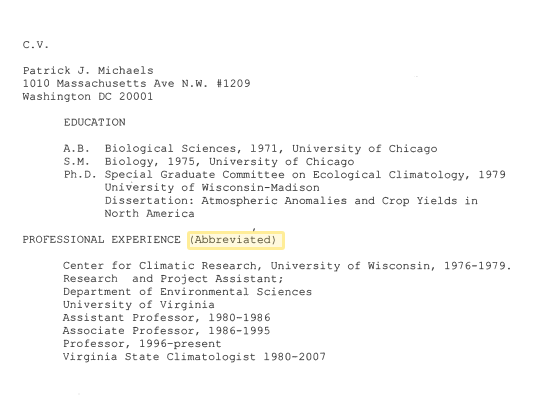 In the CV Michaels originally submitted to the committee, he did “not list any affiliation with New Hope Environmental Services,” a consulting firm founded by Michaels. New Hope, according to Michaels, was intended to “publicize findings on climate change and scientific and social perspectives that may not otherwise appear in the popular literature or media.” As Welch points out in his questioning, an affidavit filed by Michaels in 2007 described New Hope as his “sole source of income,” making his omission particularly noteworthy. Michaels also neglected to mention his work as “a contributing editor to the monthly publication Environment and Climate News,” which is published by the Heartland Institute. He also didn’t include his role as an editor in the Western Fuels Association State of the Climate Reports, both of which “were advocating against greenhouse gas emissions regulation” during the time Michaels was editing them. Welch pushed Michaels to “explain why you did not disclose your role with an anti-regulatory organization who considers elected officials to be its primary audience,” and notes that the CV provided by Michaels “omits the names of your funders that have a financial interest in government inaction on climate change issues.” Given that the hearing was concerned with climate change regulation and that Michaels was the only one to dismiss the need to act on climate change, Welch argued that the information omitted in Michaels’ CV was “important in helping the Committee to understand the appropriate weight it should assign” to his testimony.